This clear, beautifully presented book provides an introduction to tai chi, its mind body principles and guidelines for practice. Developed as an illustrated reference book, it includes over 350 color photographs, featuring step-by step instructions in Tricia Yu 's Tai Chi Fundamentals Program. It is useful to beginners as well as advanced practitioners and tai chi instructors and those who simply wish to learn more about tai chi. It familiarizes you with essential elements of tai chi: breathing in a relaxed, natural manner; sensing qi (life energy), or becoming more alive to each moment; and warming up slowly and gently in order to prepare you, both physically and mentally, for your tai chi practice. Tai Chi Mind and Body is an ideal companion to the Tai Chi Fundamentals video and DVD. 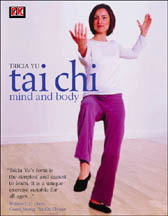 "I would like to recommend "Tai Chi Mind and Body", Tricia Yu 's new book. It is beautifully organized and illustrated. I've done t'ai chi for 19 years and have perused many of the books and watched many of the videos on the market. This is the first book that I think one could use and really teach oneself the form."